Success on any project requires each individual to take responsibility. As with any team, individuals need to be in the role they are qualified to play. Well defined Roles and Responsibilities for clarity and security. I am a great believer in the use of well defined roles and responsibilities, as this helps to cover all the activities that need to be carried out for a project to be successful. 1: They help people to understand exactly what is expected of them in a particular role and gives them a clear sense of purpose. 2: They supply a framework for accomplishing tasks, as individuals know what is expected of them and which roles (people) will do the work they are dependent on. 3: Increases flexability in a team or organisation as one person can fill more than one roll, or one role can have more than one person allocated, depending on the complexity and size of each individual project. On smaller projects one person will take on more than one role. You scale the number of people in relation to the project. The roles and their corresponding definitions remain constant most of the time. What happens when you do not have well-defined roles and responsibilities? Any time there’s a lack of clarity, people waste energy dealing with things that don’t matter. They argue over things that are not important, fail to focus on jobs that are important, and miss out on opportunities. Make your life easy, allocate each person to the right role. Define roles and responsibilities, and allocate the right people to each role then their energy becomes accessible for doing the work that needs to be done. What is important is that the different interest groups are represented appropriately within the project organisation. Having the right people in the project organisation is a necessary condition to effective project management and delivering the project output in a cost effective way. The project executive represents the business interests and has ultimate responsibility for the business success. You can allocate more than one role to an individual, for example when appropriate one person can have the project executive role and the product owner role. When the project is part of a programme the project executive may also be part of the programme board for the duration of the project. In smaller programmes the programme executive (or senior responsible owner SRO) may also take the project executive role. The product owner should come from the business/organisation department that will use the project product. 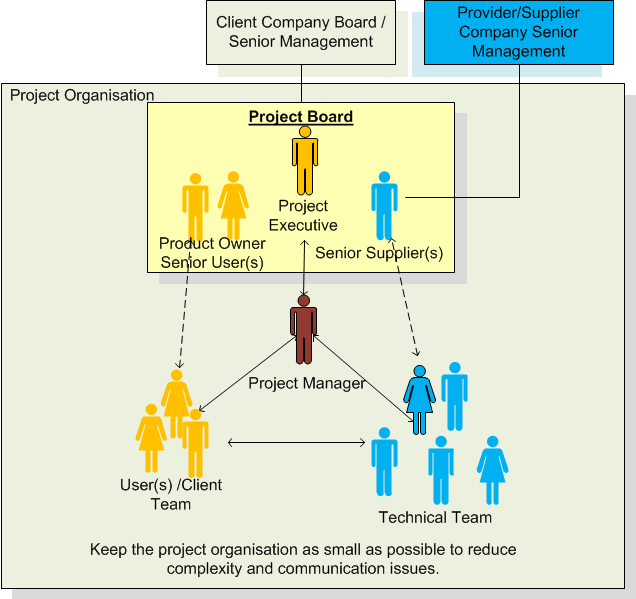 In the ideal world the product owner will be available to the project organisation whenever needed. In the real world the product owner often has other responsibilities, in this case it is important that a suitable deputy can represent the product owner. In the programme setting the product owner will also be a suitable business change manager (BCM) or a member of the business change team. In the project context the product owner has the responsibility of identifying and defining benefits at the begining and during the project, then tracking the achievment of outcomes and realisation of benefits post project. Represents the interests of the supplier organisation and makes sure that the supplier makes the right resources available to the project. The project board comprises of the project executive, product owner/senior user and the senior supplier, as a group and individually they must have the following attributes. The project manager takes care of the day-to-day management of the project on behalf of the project board. The project manager must make sure that the project has a viable business case and that the output from the project will deliver the capability required by the business (product owner). The project manager must facilitate the work of the production team, helping tp remove constraints and ensure the flow of communication. Once a work package is agreed with the production team, let the production team work out how they will deliver within the agreed tolerances. Be available to help team members as and when necessary. In smaller project the business analyst role can be taken on primarily by the project manager. It is becoming more and more common to have a person allocated to the business analyst role. The business analyst reports to the project manager and takes care of making sure the project delivers business value. The technical team leader has responsibility for all the team members work in the production team, this will include the users who are working with the production team for the period they are required. 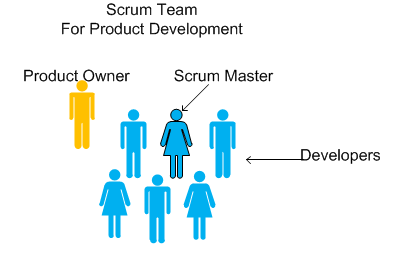 For those who like to work with scrum I equate the technical team leader as the scrum master. It is not uncommon for projects to be run without the involvement of the end users, this is especially true in the software industry. Experience has shown that there is a distinct advantage to have end users involved in the development of new products that they will then work with in the business environment.